We are happy to welcome people of all ages and from all backgrounds. The concept of kendo is defined by the All Japan Kendo Federation as: “to discipline the human character through the application of the principles of the katana (sword).”Together as children and adults, students and instructors, we work as a society to develop our human character through the sincere practice of kendo.In our regular practice at Koiwa Kenyukai, we aim to improve our kendo by synchronizing the movement of our body, technical skill and strength of spirit. At Koiwa Kenyukai, we take care to follow the principles of gratitude and sincerity. 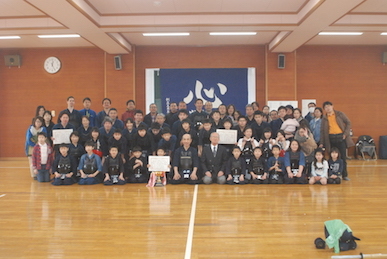 For children to learn these important concepts of kendo, we practice wholeheartedly and with a positive mindset. In this way kendo practice becomes a place of learning lessons for life. Copyright (C) 2014　小岩剣友会 , All rights reserved.